If you live in the Midwest, chances are you have good credit. NerdWallet took a look at the average credit scores of metropolitan areas in the U.S. to rank the places with the best and worst credit, and the Midwest topped the rankings, while cities in the South made up the other end of the list. The holiday season is one of the biggest spending periods in the year, with 82% of consumers planning to use their credit cards to make purchases. With this in mind, we looked at the places where residents can feel good about their holiday spending as well as the areas where people might need to think twice about their credit history. Merry in the Midwest. Of the top 10 places with the highest average credit scores, Wisconsin is home to four, and eight are elsewhere in the Midwest. Many of these places — including the Twin Cities metro area in Minnesota, which topped the list — also have healthy local economies with low unemployment rates and above average income levels. Residents here can feel good about using credit cards for their holiday shopping. Southern residents struggle. Of the 10 places with the lowest average credit scores, eight are in the South. In Texas, the Harlingen-Weslaco-Brownsville metro area’s population has the lowest average credit score in the U.S. Income levels here are much lower than the national average, as is the cost of living — Harlingen is the most affordable city in the country. People who live in one of these 20 places might want to focus on their credit as part of resolutions for the new year. Open cards matter. Residents of the top 20 places with the best credit have an average of 3.33 open credit cards, while those in the 20 areas with the worst credit carry 2.68 open credit cards. Remember, your credit score is important since it not only serves as an assessment of your financial habits, but it also determines your eligibility when you apply for credit cards, loans and more. Pay all of your bills (credit cards and others) on time. No exceptions. Keep balances on all of your credit cards below 30% of the total credit line at all times during the month. Start using credit responsibly as soon as you can — for most people, the easiest way to do this is by getting a credit card in early adulthood. Then, pay it on time, and in full, every month. Only apply for credit if you actually need it. Every hard inquiry to your credit report will cause your score to dip, so get new credit only if it’s a necessity. Be cautious about credit card applications — too many at once is a signal that you’re in financial trouble, and your credit score will drop as a result. For most people, waiting six months between applications is a smart idea. Check your 3 credit reports at least once a year using AnnualCreditReport.com. If you spot an error, take steps to have it corrected. Be cautious about rate shopping. If you’re trying to find the bank that will give you the best deal on a mortgage or auto loan, be sure to complete all applications in a 30-day window. Think twice about closing old credit cards. Cutting off thousands of dollars of available credit at once could drive up your credit utilization ratio. Unless a card you’re not using is charging an annual fee, most consumers will benefit from keeping the card open. Keep old credit cards active. Recent account activity has a greater bearing on your credit score than older activity, so it’s smart to use an old card every so often. For most people, the easiest way to do this is by linking an old card to a recurring monthly payment, such as a Netflix subscription or a gym membership. If your credit score is lagging and you’re having a hard time getting approved for a credit card, consider becoming the authorized user on someone else’s account. As long as the issuer is reporting authorized user activity to the credit bureaus, your score will get a boost from the primary card user’s good habits. If you’re looking to open a new credit card, make sure to check out your options for the best low interest, best balance transfer, best rewards and best overall credit cards. In the tables below, check out the 20 places with the best credit and the 20 with the worst credit as ranked by average VantageScores. We’ve also included the average number of open credit cards for residents in each metro area, since there’s a positive correlation between the number of open credit cards and credit scores. Credit score and open credit card data are from Experian. We analyzed 143 of the largest U.S. metropolitan areas. 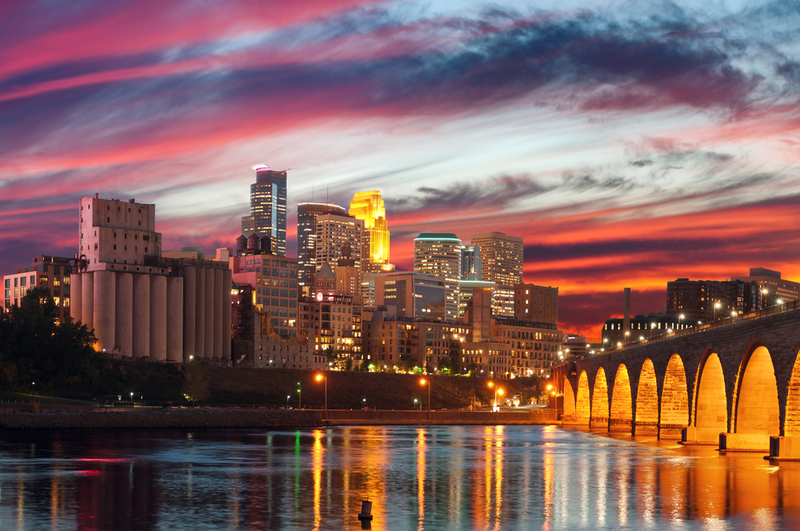 Minneapolis, Minnesota, image via Shutterstock.